Azure SQL Database is an automatically managed and flexible data service where you can easily monitor usage, add or remove resources (CPU, memory, I/O), find recommendations that can improve performance of your database, or let database adapt to your workload and automatically optimize performance. Monitoring the performance of a SQL database in Azure starts with monitoring the resource utilization relative to the level of database performance you choose. Azure SQL Database enables you to identify opportunities to improve and optimize query performance without changing resources by reviewing performance tuning recommendations. Missing indexes and poorly optimized queries are common reasons for poor database performance. You can apply these tuning recommendations to improve performance of your workload. You can also let Azure SQL database to automatically optimize performance of your queries by applying all identified recommendations and verifying that they improve database performance. In the Azure portal, click SQL databases, select the database, and then use the Monitoring chart to look for resources approaching their maximum. DTU consumption is shown by default. Click Edit to change the time range and values shown. Use Query Performance Insight to identify the queries that spend the most of resources. Use SQL Database Advisor to view recommendations for creating and dropping indexes, parameterizing queries, and fixing schema issues. Use Azure SQL Intelligent Insights for automatic monitoring of your database performance. Once a performance issue is detected, a diagnostic log is generated with details and Root Cause Analysis (RCA) of the issue. Performance improvement recommendation is provided when possible. Enable automatic tuning and let Azure SQL database automatically fix identified performance issues. Use dynamic management views (DMVs), extended events, and the Query Store for more detailed troubleshooting of performance issues. See performance guidance to find techniques that you can use to improve performance of Azure SQL Database after identifying the performance issue using one or more of the above methods. Once you've added these metrics, you can continue to view them in the Monitoring chart with more information on the Metric window. All four metrics show the average utilization percentage relative to the DTU of your database. See the DTU-based purchasing model and vCore-based purchasing model articles for more information about service tiers. You can also configure alerts on the performance metrics. Click the Add alert button in the Metric window. Follow the wizard to configure your alert. You have the option to alert if the metrics exceed a certain threshold or if the metric falls below a certain threshold. For example, if you expect the workload on your database to grow, you can choose to configure an email alert whenever your database reaches 80% on any of the performance metrics. You can use this as an early warning to figure out when you might have to switch to the next highest compute size. The performance metrics can also help you determine if you are able to downgrade to a lower compute size. Assume you are using a Standard S2 database and all performance metrics show that the database on average does not use more than 10% at any given time. It is likely that the database will work well in Standard S1. However, be aware of workloads that spike or fluctuate before making the decision to move to a lower compute size. To diagnose and resolve performance issues, begin by understanding the state of each active query and the conditions that cause performance issues relevant to each workload state. 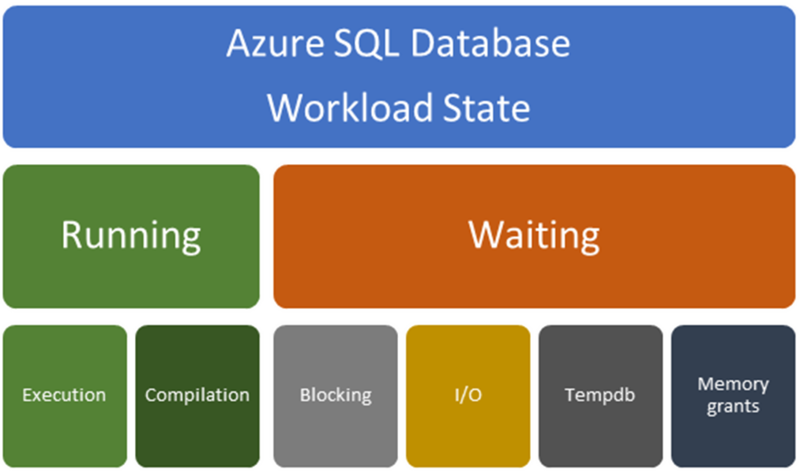 To improve Azure SQL Database performance, understand that each active query request from your application is either in a running or a waiting state. When troubleshooting a performance issue in Azure SQL Database, keep the following chart in mind as you read through this article to diagnose and resolve performance issues. For a workload with performance issues, the performance issue may be due to CPU contention (a running-related condition) or individual queries are waiting on something (a waiting-related condition). 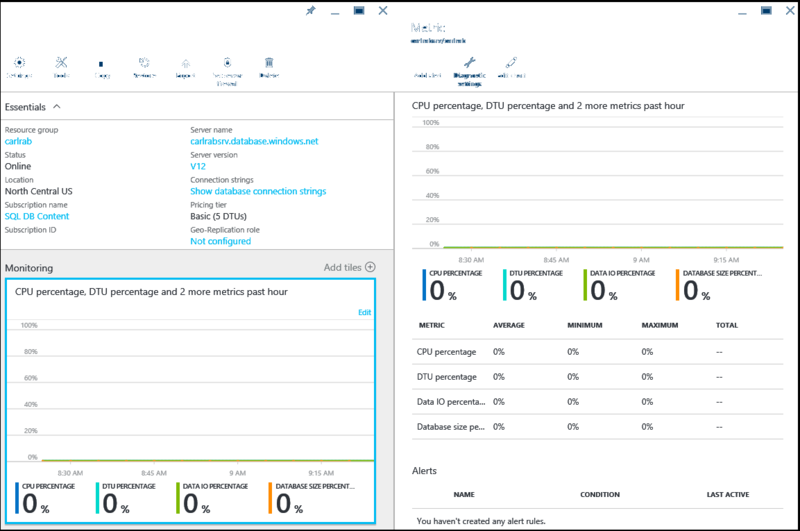 Use the Azure portal to monitor CPU percentage utilization. sys.dm_db_resource_stats returns CPU, I/O, and memory consumption for an Azure SQL Database database. One row exists for every 15 seconds, even if there is no activity in the database. Historical data is maintained for one hour. sys.resource_stats returns CPU usage and storage data for an Azure SQL Database. The data is collected and aggregated within five-minute intervals. For a set a T-SQL queries using these DMVs to troubleshoot CPU utilization issues, see Identify CPU performance issues. The parameter sensitive plan (PSP) problem refers to a scenario where the query optimizer generates a query execution plan that is optimal only for a specific parameter value (or set of values) and the cached plan is then non-optimal for parameter values used in consecutive executions. Non-optimal plans can then result in query performance issues and overall workload throughput degradation. For more information on parameter sniffing and query processing, see the Query Processing Architecture Guide. Use the RECOMPILE query hint at each query execution. This workaround trades compilation time and increased CPU for better plan quality. Using the RECOMPILE option is often not possible for workloads that require a high throughput. Use the OPTION (OPTIMIZE FOR…) query hint to override the actual parameter value with a typical parameter value that produces a good enough plan for most parameter value possibilities. This option requires a good understanding of optimal parameter values and associated plan characteristics. Use OPTION (OPTIMIZE FOR UNKNOWN) query hint to override the actual parameter value in exchange for using the density vector average. Another way to do this is by capturing the incoming parameter values into local variables and then using the local variables within the predicates instead of using the parameters themselves. The average density must be good enough with this particular fix. Disable parameter sniffing entirely using the DISABLE_PARAMETER_SNIFFING query hint. Use the KEEPFIXEDPLAN query hint to prevent recompiles while in cache. This workaround assumes the good-enough common plan is the one in cache already. You may also disable automatic updates to statistics in order to reduce the chance of the good plan being evicted and a new bad plan being compiled. Force the plan by explicitly using USE PLAN query hint (by explicitly specifying, by setting a specific plan using Query Store, or by enabling Automatic Tuning. Replace the single procedure with a nested set of procedures that can each be used based on conditional logic and the associated parameter values. Create dynamic string execution alternatives to a static procedure definition. In the prior example, t1.c1 takes @p1 but t2.c2 continues take GUID as literal. In this case, if you change value for c2, the query will be treated as a different query and a new compilation will occur. To reduce compilations in the prior example, the solution is to also parameterize the GUID. Once you identify the issue, you can either tune the problem queries or upgrade the compute size or service tier to increase the capacity of your Azure SQL database to absorb the CPU requirements. For information on scaling resources for single databases, see Scale single database resources in Azure SQL Database and for scaling resources for elastic pools, see Scale elastic pool resources in Azure SQL Database. For information on scaling a managed instance, see Instance-level resource limits. Are the queries from the application the cause of the high-CPU issue? Determine if there were multiple execution plans associated with the same query. If so, determine why. For queries with the same execution plan, determine if the execution times were consistent and if the execution count increased. If yes, there are likely performance issues due to workload increase. To summarize, if the query execution plan didn't execute differently but CPU utilization increased along with execution count, there is likely a workload increase-related performance issue. For example, consider a scenario where CPU increased to 80% for an extended period of time. CPU utilization alone doesn't mean workload volume changed. Query execution plan regressions and data distribution changes can also contribute to more resource usage even though the application is executing the same exact workload. An application may drive a new set of queries at different times. This scenario is the most obvious measure of workload. The number of queries doesn't always correspond to more resource utilization. However, this metric is still a significant signal assuming other factors are unchanged. The Query Store provides wait statistics per query over time. In Query Store, wait types are combined into wait categories. The mapping of wait categories to wait types is available in sys.query_store_wait_stats. sys.dm_db_wait_stats returns information about all the waits encountered by threads that executed during operation. You can use this aggregated view to diagnose performance issues with Azure SQL Database and also with specific queries and batches. sys.dm_os_waiting_tasks returns information about the wait queue of tasks that are waiting on some resource. Query Store and wait statistics-tracking dynamic management views only show results for successfully completed and timed-out queries and do not show data for currently executing statements (until they complete). The dynamic management view sys.dm_exec_requests allows you to track currently-executing queries and the associated worker time. Finally, if there are no actionable items that can improve performance of your database, you can change the amount of resources available in Azure SQL Database. You can assign more resources by changing the DTU service tier of a single database or increase the eDTUs of an elastic pool at any time. Alternatively, if you're using the vCore-based purchasing model, you can change either the service tier or increase the resources allocated to your database. For single databases, you can change service tiers or compute resources on-demand to improve database performance. For multiple databases, consider using elastic pools to scale resources automatically. You can change application code to more optimally use the database, change indexes, force plans, or use hints to manually adapt the database to your workload. Find some guidance and tips for manual tuning and rewriting the code in the performance guidance topic article. To enable automatic tuning in Azure SQL Database and let automatic tuning feature fully manage your workload, see Enable automatic tuning. To use manual tuning, you can review Tuning recommendations in Azure portal and manually apply the ones that improve performance of your queries.